Step 1: Decide if you would rather take pre-orders from the supplied order form or order bags first and then sell in-hand. Bags take 3-4 weeks for delivery. Step 2: Fill out a Fundraising Agreement and fax or mail it in to Resource Solutions. If ordering bags first, use Lawn & Kitchen bulk order form and send in with agreement. Otherwise, send this form in after taking pre-orders. 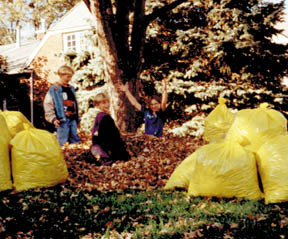 Trash bags must be paid for upon order unless pre-approved for credit. Make a list of family, friends, neighbors, coworkers and acquaintances. If taking orders, we recommend a 1-2 week selling period including 2 weekends. This will keep your participants motivated and on track. Step 5: If pre-orders were taken, deliver bags to your customers. You are finished.